Coming from the south (autobahn A3) or east (autobahn A4) via interchange “Köln-Ost”, keep in the direction of the city centre (“Zentrum”). You cross the river Rhine and follow the road along “Innere Kanalstrasse” until you pass by the television tower (“Fernsehturm”). 300 metres further down the road, you turn right at the Central Mosque (“Zentralmoschee”) into Venloer Strasse and then right again after around 300 metres, which will take you into Leostrasse. Coming from the north (autobahn A57) or west (autobahn A4 or A1) via interchange “Köln-Nord”, keep in the direction of the city centre (“Zentrum”) until the motorway comes to its end. 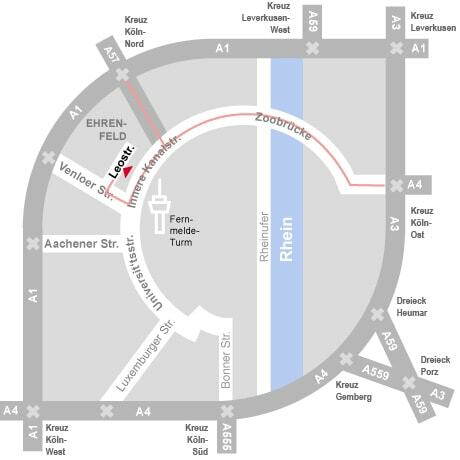 After the tunnel, take a right turn (in the direction of “Köln-Süd/Lindenthal”) onto “Innere Kanalstrasse”. You will see the television tower on your left and then turn right into Venloer Strasse after 300 metres. After another 300 metres turn right into Leostrasse. 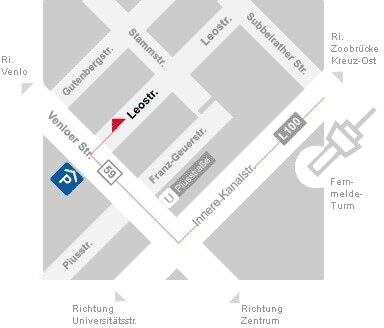 … with a bit of luck you will find a space right next to the office directly in Leostrasse (free of charge). The closest underground parking is in Venloer Strasse, only a few minutes away on foot. From the airport, take a taxi to Ehrenfeld, Leostrasse 84. One way will cost around €45 and it will take around 30 minutes. Tell the taxi driver: “Bitte Leostraße über die Venloer Straße anfahren.” (“Please drive into Leostrasse via Venloer Strasse”). Alternatively, take the S-Bahn (suburban train) line S13 in the direction of Köln-Ehrenfeld or Horrem or the regional express RE8 in the direction of Mönchengladbach alighting at Köln-Ehrenfeld station, exiting that station towards the front of the train. Take U-Bahn (underground) line 3 in the direction of Thielenbruch or line 4 in the direction of Schlebusch. It is two stops to Piusstrasse. From there it is 2 minutes’ walk to Leostrasse 84. This will take about 35 minutes altogether and cost €2,80 (CityTicket Köln, price level 1b). From Cologne Main Station (“Köln Hauptbahnhof”), take a taxi to Ehrenfeld, Leostrasse 84. One way will cost around €10 and will take around 10 minutes. Tell the taxi driver: “Bitte Leostraße über die Venloer Straße anfahren.” (“Please drive into Leostrasse via Venloer Strasse”). Alternatively, at Main Station, take U-Bahn (underground) line 16 or 18 (in the direction of Neumarkt) one stop, alighting at Appellhofplatz, changing there to line 3 or 4 (in the direction of Bocklemünd, you need to walk over to the platform opposite). Get off at stop Piusstrasse. From there it is 2 minutes’ walk to Leostrasse 84. Travelling time is around 15 minutes in total and the cost €2,80 (CityTicket Köln, price level 1b). To calculate your route, please click on the link in the marker on our interactive Google Map which will automatically recognise your location.